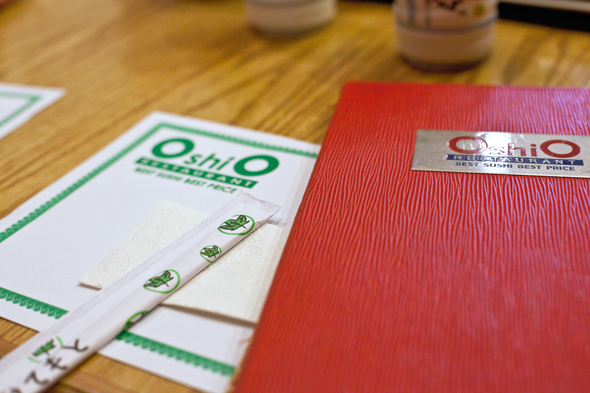 Oshio Japanese Restaurant has been a long-time resident in the bus terminal of a mall at Don Mills and Steeles . Taken over two years ago by new owners, little has changed and that's not always a good thing. While the restaurant receives steady business throughout the day, the service is awkward and the interior is dated. But one doesn't come to the border of the GTA for shoji screens or fake silk flowers. With a sizeable Asian demographic, Markham is a mecca of culinary delight and Japanese food is no exception. While there are several private shoji-screened booths (those favouring shoe-less dining take note) we opted to sit in the compact dining room and the lunchtime rush quickly enveloped us. While Oshio features a decent bar menu with several Sake options (Cold, Nigori, Ginjo) that mingle with their typical beer varieties (Sapporo, Asahi, Kirin, Heineken and domestics) we instead accept the green teas that were plunked before us. After about five minutes, we flag down our frenzied server to take our food order. Before our food arrives, a small bowl of Congee is brought out as a zensai. It's creamy and flecked with morsels of chicken and egg--entirely inhalable. 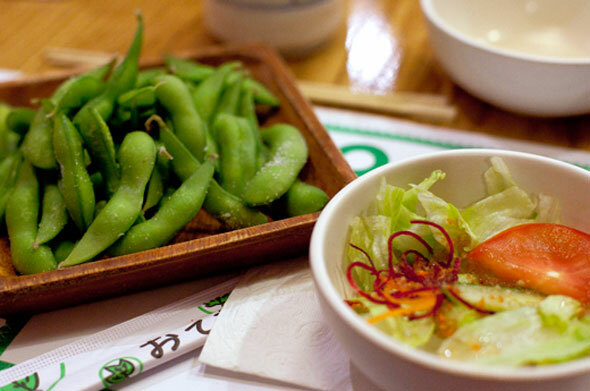 Edamame beans ($2.95) came swiftly after; a standard size portion of pods, dusted with salt and piping hot. The usual accompaniments were also quickly dispersed: miso soup with chunks of tofu, and tiny bowls of iceberg lettuce with shredded carrots and one slice of tomato. Not very imaginative, but familiar, simple and tasty; isn't that what really counts? Sushi combo A ($6.95 + $1 for spicy sauce upgrade) comes with the aforementioned soup and salad. The sushi was stellar; assorted nigiri in ample fresh portions contended with the marvellous spicy salmon rolls that were well worth the extra expense. The spicy salmon rolls were some of the best I've had; the creamy sauce was liberally spread, and was a good match to the spicy kick of wasabi. 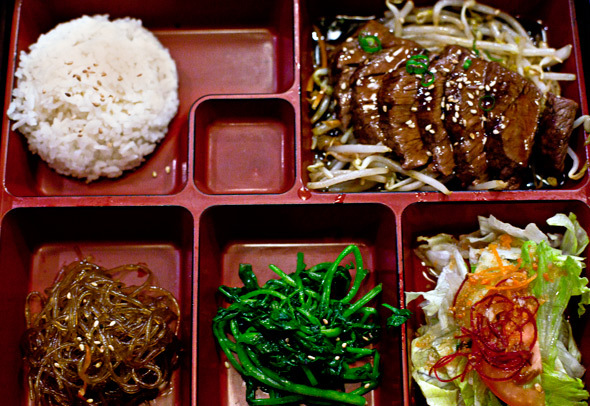 Beef Teriyaki ($8.99) came bento style which fed my compulsion of keeping things separate (in a good way). Tender slices of beef were cooked to order, draped on a bed of bean sprouts, and crowned with a smattering of green onions. The accompanying sides--a puff of rice, Chinese broccoli, more salad, and delicate sesame-scented glass noodles--were all spot on, although the salad was a bit redundant. In my search for the best sushi pizza , this contender had all the right parts. The spicy salmon sushi pizza ($7.99) was excellent value for its tiny price and massive portion. The unexpected mix of unagi and spicy sauces made for cluttered presentation, but irresistible pizza. Fresh avocado slices enhanced the overall look, as did the draping of roe, and the 'pizza' crust was evenly cooked with the right amount of crunch. Oshio's slogan is "Best sushi, best price," and while I think best is a bit of a stretch, they do offer great value, the portions are generous, and the fish is fresh. The interior could use some tweaking, the service is abrupt and hurried, and the location is, well, sort of depressing. 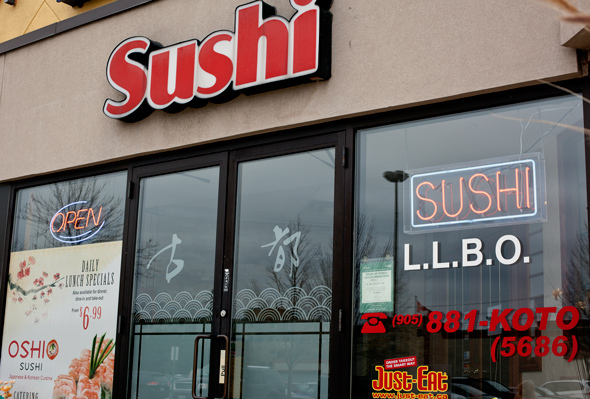 If you can tackle the gloomy blend of scenery and service, then they'll be sure to hook you up with their honest and basic approach to sushi. 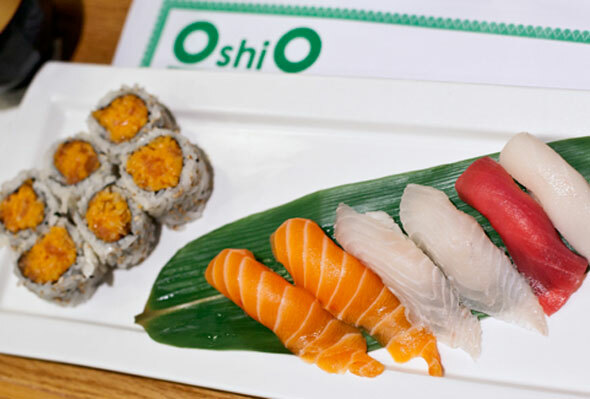 Oshio accepts reservations and is listed with Just-eat.ca for delivery.